China has agreed to finance the building of Britain's new nuclear power station at Hinkley Point in south west England by pumping in a third of the US$37 billion cost after its original backing was put in doubt. The UK has struggled to make progress on its new nuclear build program, with delays over the construction of Hinkley Point C power station, which has been beset with technical problems as well as financial doubts. A picture shows development land where the reactors of Hinkly C nuclear power station at Hinkley Point will be built on the west coast of England. French energy giant EDF is set to confirm the financial go-ahead for Hinkley Point C after it was thrown into doubt because of the drop in demand for nuclear energy, following the Fukushima incident in which the Japanese nuclear power station was hit by a tsunami. This led to France, Germany and Italy all scaling back their nuclear power plans. The consequent downturn led to EDF partner, Areva, announcing in February it expected its 2014 net loss to widen to about US$5.6 billion, from a year earlier. That precipitated a French government high-level meeting that led to the state-controlled utility EDF buying a majority stake in the reactor business of nuclear group Areva. That had knock-ons for Hinkley Point, where EDF had intended to own a 45-50 percent stake in it with Areva's nuclear arm covering 10 percent of the equity, two Chinese nuclear firms covering 30-40 percent and additional stakeholders covering up to 15 percent. However, an EDF's takeover of Areva's nuclear business would cancel out the 10 percent stake dedicated to the French firm, meaning the company had to re-assess its equity structure if the deal were to go ahead. There was added controversy when the UK government agreed a guaranteed price for the electricity generated by the power station — the so-called 'strike price' — which will be US$143/MWh over a 35 year period, which environment group Greenpeace described as being "nearly double the current market price for electricity." Meanwhile, the UK National Audit Office, in its briefing for the House of Commons Energy and Climate Change Select Committee, quoted 2011 revisions to DECC's costs of nuclear power as being US$114/MWh. The original claim of cost in the 2008 White Paper, in which the UK government justified supporting new nuclear, was US$59/MWh. Technical issues have also hit the program. EDF Energy in September announced a further postponement of the commissioning of the gigantic new nuclear power station at Flamanville in northern France — the same design as the proposed Hinkley C plant — and admitted the price has more than tripled. 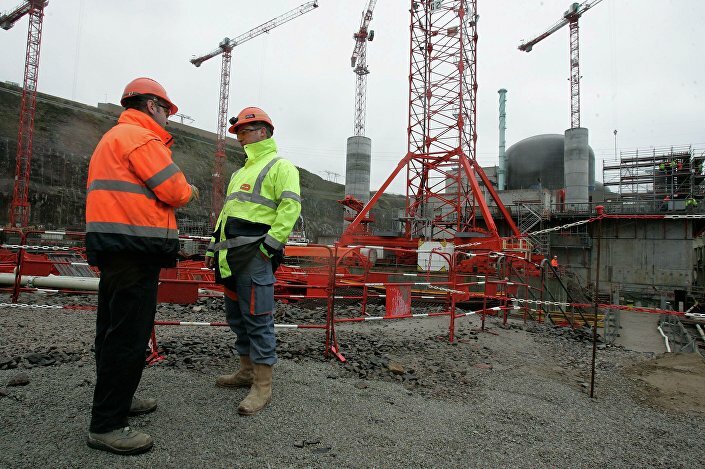 Workers are seen on a construction site of France's first new generation nuclear reactor in Flamanville, northwestern France, Friday, Feb. 6, 2009. The new so-called European Pressurized Reactors (EPR) plant on the Normandy coast, will be operational in 2012. The new-build plant at Flamanville, which at will be one of the world's biggest nuclear power was plunged into chaos earlier this year when the French nuclear safety watchdog said it has found "multiple failure modes" that carry "grave consequences" on crucial safety relief valves on the plant, which could lead to meltdown.